Please join us for a showing of Food for Change in our upstairs classroom. This is a free event and we will provide snacks and refreshments. 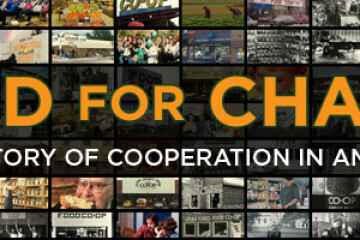 The showing of this film is co-sponsored by Dunn County Farmers Union Film description: Food For Change is an 82-minute documentary film focusing on food co-ops as a force for dynamic social and economic change in American culture. This is the first film to examine the important historical role played by food co-ops, their pioneering quest for organic foods, and their current efforts to create regional food systems. Additionally, the film shows how cooperatives today strengthen local economies and build food security. The goal is to educate a wide audience about the principles of cooperation with a focus on healthy food and a healthy economy.